This page covers the author of The Bishop of Hell and Other Stories. For other authors named Marjorie Bowen, see the disambiguation page. 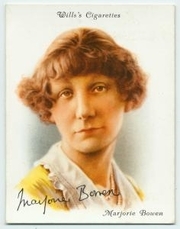 Marjorie Bowen was the principal pen name of Margaret Gabrielle Vere Long, née Campbell. She was born on Hayling Island, Hampshire, England, and had a difficult childhood. The family moved constantly to escape debt. Her father was an alcoholic who disappeared and was later found dead on the streets of London. Marjorie did not go to school, but was self-educated in libraries and museums. She published her first novel, The Viper of Milan: A Romance of Lombardy, in 1906 at age 21, and thereafter was the breadwinner for an ungrateful family. Under this financial pressure, she produced more than 150 books using half a dozen pseudonyms, most of them historical fiction, Gothic novels, romance novels, and crime stories. She also wrote history, children's books, biographies, short stories, literary criticism, and tales of the supernatural. Her writing was widely admired by other authors, including Graham Greene. She was married twice: her first marriage took her to Italy, where she lived during the years of World War I. She wrote an autobiography, The Debate Continues (1939). "Marjorie Bowen" is composed of 2 distinct authors, divided by their works. You can edit the division. Marjorie Bowen is composed of 5 names. You can examine and separate out names.